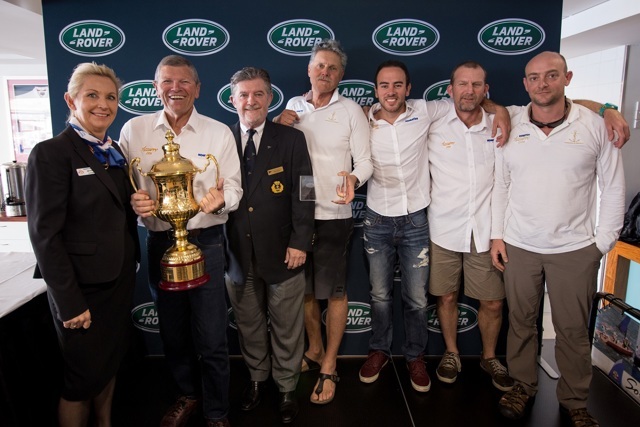 For the second time in three years Shane Kearns' Komatsu Azzurro has powered to overall victory in the Land Rover Sydney Gold Coast Yacht Race, finishing the 2017 event in a corrected time of 3 days 1 hour 40 mins 25 seconds, 2 hours 36 mins and 23 seconds ahead of Ian Creak’s Beneteau 47.7 Ausreo in second. Komatsu Azzurro, an S&S 34 designed by Sparkman Stephens, were big beneficiaries of Monday night’s wind shift from northly to southerly which almost all of the faster boats finished ahead of. It meant the six-strong crew were able to set themselves for race against time, a race they knew they were comfortably leading. Tactical options were fairly limited in the smaller 34 footer in the offshore race but Kearns knew he still had to play his hand right, “From the beginning we knew we had to keep in contact with the bulk of the fleet and to their dismay, and our delight, we did that. With the wind shift they couldn’t shake us and that’s how we got the result. The result is the second win for Kearns and Azzurro in the past three years and he believes it will shake any accusations of good fortune being at the heart of their victories.